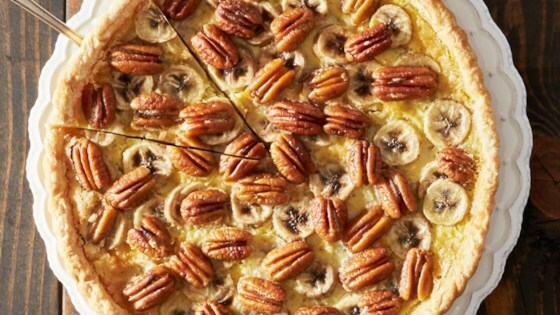 "Bananas, pecans, and caramel marry in this decadent dessert tart that's a twist on pecan pie." In a large bowl stir together flour, the 1 tablespoon sugar, nutmeg, and salt. Using a pastry blender, cut in the 1/2 cup butter until mixture resembles coarse crumbs. Stir in the ice water, 1 tablespoon at a time, just until dough starts to form. Knead gently for four to five strokes. Cover and chill for at least 1 hour or until dough is easy to handle. On a lightly floured surface roll dough into a 12-inch circle. Transfer pastry to a 10-inch tart pan. Press pastry into fluted side of pan trim pastry even with rim. Freeze for 20 minutes. Preheat oven to 400 degrees F. Prick bottom and side of pastry with a fork. Line pastry with double thickness of Reynolds Wrap(R) Aluminum Foil. Place on a baking sheet. Bake about 15 minutes or until pastry is set. Remove the aluminum foil. Bake about 10 minutes more or until pastry is light golden brown. Cool on a wire rack. Reduce oven temperature to 350 degrees F.
Place sliced banana in baked pastry shell. Top with pecans. In a small bowl combine eggs, the 1/2 cup sugar, melted butter, and vanilla. Carefully pour over banana and pecans. Bake about 30 minutes or until filling is set and slightly puffed. Cool on a wire rack for 30 minutes. If desired, drizzle with caramel topping and serve with ice cream. Treat everyone to an after dinner treat with Coffee-Dusted Pear Galettes! Prebaking is the secret behind a perfect crust for this elegant and rich tart. Line the pastry-filled tart pan with a double thickness of aluminum foil and prebake. The double layer of aluminum foil keeps the crust from bubbling up as it cooks, so the crust remains flat and even when the filling is added.